Except for a laser printer, a hard drive is probably the most expensive peripheral you will buy for your ST. Although the price is high (compared to a floppy drive), the advantages are many. Once you have tried a hard drive, you will wonder how you ever got along without one. The first advantage is a lot of storage—hard drives range in size from a minimum of 20 megabytes (the equivalent of 55 single-sided floppies) to 100 megabytes (278 single-sided floppies). While you don't have an unlimited amount of space, having all of your most commonly used programs in one place is very convenient. Before I got my hard drive, I was constantly searching through my vast collection of floppies to find the program I wanted. Now, I just bring it up from my hard drive in a few moments. The next advantage is speed. A hard drive loads and saves data at many times the speed of floppy drives, even relatively fast floppy drives like the Atari ST drives. The difference can result in a real increase in efficiency, as large files are loaded and saved in just a few seconds, while the same operation on a floppy may take many minutes—if the file could have been saved at all. Remember, the 1040ST and Megas can hold more data in memory than can be saved on a disk. You could, therefore, write a program which couldn't be saved on a floppy disk. I've done it myself. In general, installing a hard drive is much simpler on the ST than on many other computers, because the ST has a plug on the back into which you simply plug the disk drive. Special software then needs to be placed on your boot-up disk so that your ST will recognize the existence of the hard drive, and your desktop will need to be modified so that the hard drive icons appear. These operations are satisfactorily explained in most of the manuals for the various hard drives. Once the hard-drive icon is visible on the desktop, you use it just like any other drive. In addition to the software necessary to make your ST recognize the hard drive, other pieces of software are required, and some hard drives come with additional software that makes it easier (and safer—more on this) to use the hard drive. First of all, you need to be able to format the hard drive. This procedure is similar to formatting a floppy disk; it prepares the disk to receive data. Though all of the hard drives listed below arrive preformatted, you may need to reformat the disk if you have problems with it. Just as with a floppy, this erases all the data on the disk, so it should be done only as a last resort. The other reason for reformatting your hard drive is to change the partitions. Let me explain. Your ST is capable of recognizing a hard drive with a maximum size of 16 megabytes. Since the smallest drive sold is 20 megabytes and the largest is five times that size, this would seem to present a problem. The solution is to "partition" the single physical hard drive into several "logical" hard drives. For example, you could set up your 20-megabyte hard drive as two 10-megabyte hard drives, perhaps called "C" and "D." This has the added advantage of allowing you to keep similar or related programs on the same hard-drive partition. However, once the partitions have been set, the only way to change them (for example, to give yourself four 5-megabyte drives instead) is to reformat. All the drives come with formatting programs. All seem to work fairly well, although some are more sensitive to locating bad sectors on the hard drive and locking them out. Another piece of software that is absolutely necessary is a program for backing up your hard drive to floppy disk. A disadvantage of the hard drive is that so much valuable data is kept on them that if anything goes wrong (ominously referred to as a "crash"), a lot of data and programs can be lost. Further, hard drives are sensitive to things like dust and jolts. It is recommended that your hard drive be periodically backed up on floppies, and then these floppies can be stored away against the day that the hard drive crashes. The backup programs are different from standard copying programs, since a file to be backed up could conceivably be bigger than one floppy. Several techniques exist for backing up hard drives, some are more convenient than others, the trade-off being speed. The backup program that comes with Astra's drives works relatively well, squeezing more information on a disk by use of a special formatting scheme, but it is sloooooow, especially when the disk is unformatted and the program has to format it. David Small's Meg-a-Minute is considerably faster, but uses a "mirror image" technique of backup. I'm not sure what would happen if you tried to restore the data on a different drive. There are also incremental backup schemes, which are smart enough to back up only those files that have changed since the last backup. All the hard drives listed here come with some kind of backup program except for the ICD drives—but commercial backup programs are inexpensive. There are even some excellent public-domain backup programs. Backing up your hard drive is such a drawn-out process that most people never bother—much to their chagrin when (not if) their drives crash. "Parking" the hard-drive head refers to moving the head over a portion of the drive where no data is stored and locking it there. This is absolutely essential if you intend to move the drive, as otherwise you may damage some data. All the hard drives either come with parking programs or are self-parking. The ST can also be taught to boot up from the hard drive, which is much faster than using a floppy, especially if you use a lot of desk accessories or GDOS fonts. The Supra and ICD drives come with auto-boot software, and these programs seem to work on other makes of hard drive as well. Both programs also allow you to disable the hard-drive boot by pressing certain key combinations. This is important if the hard-drive fails to boot for some reason, or if you want to create a boot floppy with a special custom configuration for occasional use without disabling the hard-drive boot and then rebooting. 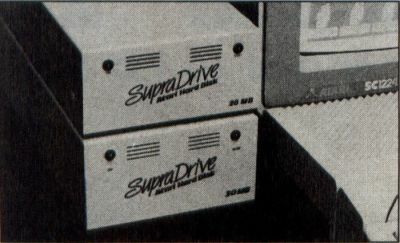 The Supra line of drives have stood the test of time well. They come with auto-boot software. 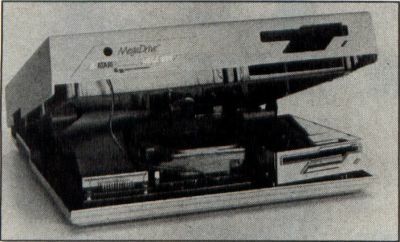 The Mega hard drive fits inside a Mega ST, though it requires a dealer or skilled technician to install it. This combination box includes a 30-Mb hard drive, 5.25-inch PC-type floppy or 3.5-inch floppy, four AC outlets on the back with four switches on the front (surge protected) and a real-time clock. The box is configured to be large enough to support a monitor and is elevated so that the ST can slide under it when not in use. It comes with software to automatically set the computer clock when you boot up. 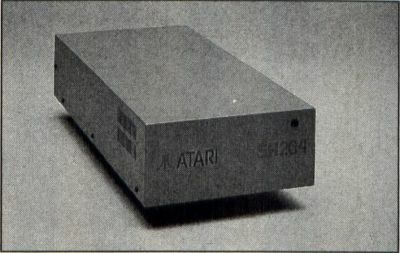 The Atari drive is a solid (if somewhat noisy) 20-megabyte hard disk. The front panel includes a power light and busy light. These hard drives are in cases which are long, low and designed to fit under your monitor or Mega box. A battery-backed clock is included, along with the software to automatically set the time in your computer from the clock. An expansion port in the back allows plugging in other DMA devices (including another hard drive). The drives can be ordered in two-drive configurations (40, 60 or 100 Mb), either giving extra storage or allowing the use of one of the independent drives as a backup for the other. Affectionately referred to as "the Tank" the HD + is very rugged. It has the On/Off switch in the front, which is a welcome change. It also has a built-in 3.5-inch double-sided drive, which can be used as drive A or B (but must be drive B in a two-floppy system). Astra doesn't use suggested retail prices, but the estimated cost of the 30-Mb version is as indicated. This new line from Astra, available with or without the 3.5-inch floppy, is designed to fit under a monitor or Mega. It has four power outlets on the back, with EFI/EMI noise suppression and surge suppression built in. Two power switches are available on the front of the case—one for the hard drive, the other for all the AC connections—making it possible to first switch on the hard drive, then turn on the rest of the system. Astra's line of rack-mounted hard drives is primarily designed for studio musicians. They are very rugged and expandable.